Urban NJ residents bear disproportionate cancer risks and have the most pressing need for parks and open space, yet they suffer a disproportionate burden of the cuts to DEP programs made by the open space diversion. Bateman, who said he was surprised to learn Caligurie opposes the measure, said many of the programs funded by the Corporation Business Tax revenue are ending. Thus, the projected revenue shortfall to fund those programs is moot, he said. One of the programs Bateman was likely referring to in his comment about CBT funded programs that “sunset” is the diesel retrofit program. The CBT FUNDING for that program shifts at the end of 2015, but the diesel air pollution and health risks remain in need of DEP science, DEP monitoring, DEP regulation, DEP permitting, DEP inspection and enforcement, and overall DEP management. Sorry Skip, that’s no “sunset”. Current CBT funding for that program is $17 million/year. Under current law, this $17 million is shifted to Parks after December 31, 2015 – thereby increasing Parks funding to $32 million (see OLS fiscal estimate). Bateman is just dead wrong about the “sunset” issue – across the board, badly wrong. There is no “sunset”. Statewide water resource, toxic site cleanup, underground storage tank removal, and Parks programs that would be cut under the open space ballot diversion do NOT “sunset”; the more than 266 DEP employees who currently are paid by CBT funds do not “sunset”, and the need for the work they do does not “sunset”. But I don’t want to talk about Open Space funding right now – I want to talk about cancer risks from air pollution, because what I just read is shocking and totally unacceptable. 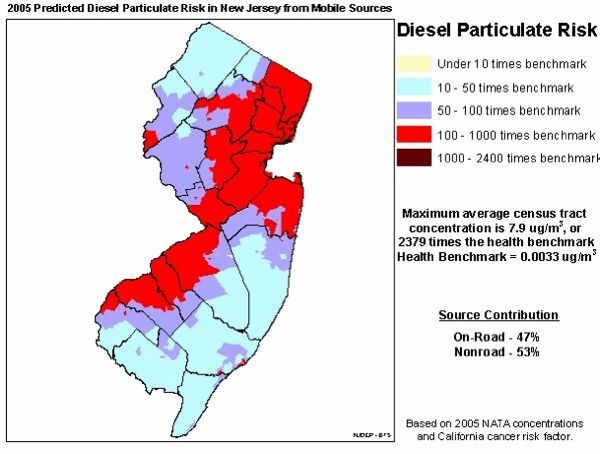 NJ has significantly high cancer risks due to hazardous air pollution, particularly due to diesel air pollution (see map above and NATA Report). That is not new information. Here is the DEP’s explanation of those diesel cancer risks. In reading that DEP document, I was stunned to learn that DEP had quietly adopted an “acceptable cancer risk” policy in the air pollution control program. This policy applies across the state, and not just to mobile sources and diesel pollution – I was not aware of that. I never heard such a highly controversial and significant public health “acceptable cancer risk” policy debated by the legislature or scientific and public health experts, or reported in the news media. I never heard the issue even mentioned by any environmental group, especially urban environmental justice advocates who live where the risks are by far the highest (and the open space and parks the smallest). Total cancer risk (from all permitted sources at a facility) that is less than or equal to 10 in a million (1×10-5) is considered negligible and no additional permit action is necessary. Total cancer risk greater than 1,000 in a million (1×10-3) is considered unacceptable. DEP will pursue enforcement action pursuant to N.J.A.C. 7:27-5, Prohibition of Air Pollution. Facilities with a total cancer risk between 10 in a million (1×10-5) and 100 in a million (1×10-4) will be requested to pursue a long-term risk minimization strategy (typically 5 years). An application for renewal of an Operating Permit must include an evaluation report on the results of these efforts. Facilities with a total cancer risk between 100 in a million (1×10-4) and 1,000 in a million (1×10-3) will be requested to pursue a short-term risk minimization strategy (typically less than one year), as well as a long-term risk minimization strategy. Specific measures must be identified in the permit to reduce risk within one year, and the facility must include with the Operating Permit renewal an evaluation report on the results of the long-term strategy. Remarkably, this policy was adopted in 2009, *and initiated under the leadership of DEP Commissioner Lisa Jackson, a black woman who claimed to be a champion of environmental justice. [*Clarifying Note: the DEP Technical Manual that adopted this policy was issued in Nov. 2009 under DEP Acting Commissioner Mauriello. Jackson was not head of DEP, but the initiative was begun under Jackson’s tenure. Ironically, DEP adopted this cancer risk policy, which has huge environmental justice implications given the mapping or health risks, during the same time they issued this December 2009 Environmental Justice Report. So, here is what it means, especially for our urban residents who bear the disproportionate burden of air pollution and cancer risks and are disproportionately denied the benefits of open space and parks funding. It means that the refinery or industrial facility down the street can dump hazards carcinogenic chemicals into the air that increase your cancer risks to 1 in 1,000. But the drinking water in your home is regulated by DEP to meet a 1 in a million risk level. Why is the air you breath allowed to be more polluted and toxic than the water you drink? Who gave DEP the right to allow such risks? Under what law did DEP adopt this unacceptable risk policy? Did this highly significant policy undergo public review and comment and comply with regulatory rulemaking procedures, as required by law? Government agencies, such as USEPA and the California Office of Environmental Health Hazard Assessment (OEHHA), have established procedures for developing human toxicity values from chemical studies in order to determine a “safe” level of human exposure. Groups of experts look at all of the available health effects studies done on a chemical, and refine the information into a dose-response value that can be used to estimate the risk to public health from exposure to that chemical. These toxicity values are referred to as unit risk factors and reference concentrations. Unit risk factors are toxicity values used for carcinogens, which estimate the increased risk of getting cancer that is associated with the concentration of the chemical in air that you are breathing. A cancer risk of less than one in a million is usually considered to be negligible. Call your legislator and demand that this policy be withdrawn and that DEP crack down on air polluters. This is just another reason to oppose open space diversion. Urban NJ bears disproportionate cancer risks and the has the most pressing need for parks and open space, yet they suffer a disproportionate burden of the cuts to DEP programs made by the open space diversion. [Update #2 – 12/2/14 – We wrote to US EPA Region 2 requesting oversight. EPA replied today and has no problem with the DEP policy. But, as described in the letter and a lengthy phone call just now, EPA failed to even review the enforcement side of the issue. We will send a followup request asking to review the enforcement implications. Bottom line: A State can not adopt an enforcement policy that undermines the terms of a permit. The permit may not allow emissions to cause or contribute to unacceptable risks. NJ DEP applies a 1 in a million risk standard in permit review. But for enforcement purposes, the DEP Technical Manual defined unacceptable risk as 1 in 1,000 – that is 1,000 times higher then the permit risk level. – end update. Update #1 – 11/3/14 – With respect to the purported success of the diesel retrofit program, I must note one thing. Here is DEP’s claimed success story, from a link prominently posted at the top of the mobile source webpage. But, for those who subscribe to the IF Stone theory of government documents (i.e. the good stuff is buried at the end in technical appendices), scroll to the bottom of the page for the real story. The NJDEP has completed the NJ School Bus Emissions Study to determine if tailpipe retrofit devices further reduce levels of diesel fine particles in school bus cabins. The study concluded that tailpipe retrofit devices do not significantly reduce in-cabin particulate levels. Therefore, the Department will not require tailpipe retrofit devices on regulated school buses. Read the fine print – that dubious finding, made to reduce school districts’ costs of compliance, needlessly exposes our kids to more cancer causing diesel fumes. Election Day, 2014 Bear Story – Who Was Stalking Who?